Welcome to TIME PEACE APARTMENT. We had remodel a typical small house into GuestHouse. 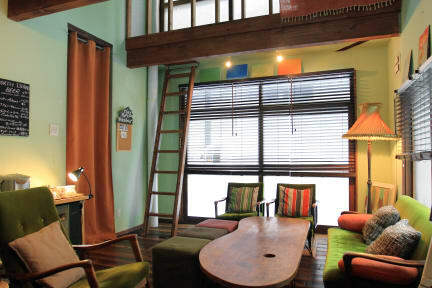 Location is convenient to get to the center of Sapporo city, just 10 min by walk to the downtown. 2stops from JR Sapporo station by subway, and 5 min walk from near the subway Station, Hosui Susukino Exit 6. *We don't have any private rooms, only dormitory rooms. *We accept only cash, Japanese Yen. *No kitchen facilities for guests. *We close the reception from 11:00AM - 4:00PM. *If you want to leave your luggage before you check in, please inform us about your arriving time in advance. Nice cosy place. The staff were very accommodating of me, despite having brought my bicycle in a gigantic box from home. A quick walk and you're in the heart of the city with plenty to do. Would happily stay again. This place was wonderful, the staff were very friendly and super nice. The facilities were in great shape and the place has a nice home feel as it looks to be a converted house. The distance from the station was a little walk but even that wasn't a real issue. Overall the place was great and would definitely stay again. It's a cozy place to stay. Would recommend to my friends. Nice hostel - good location walking distance to everywhere. Everything seemed to be clean and well cared for. Staff had limited English but were all helpful. The 8 person dorm is so cramped - not even a place to put luggage it feels as if you're on top of each other it, it also gets very stuffy with so many people in such a tight space. The other thing is you can't hangout out in the lounge past 12 so if you need to stay up you have to go to the cramped room. Probably wouldn't stay again. Nice hostel, clean, and friendly staff. Was not particularly social, though that is seeming to generally be the case at hostels in Japan. Overall good place to stay- would stay again. It was located conveniently between two stations about 5-10 minutes walking. The room was rather small and cramped but it has everything you need. Staff are helpful and friendly. Will recommend for short term stay!